Welcome to Growing in Unity, day 3! Today I used the "Slow and Steady" stamp- I love this whimsical image. I was lucky enough to win a Simon Says Stamp April 2013 card kit from Jennifer McGuire's blog (Thank you!) and the majority of the materials used on the yellow/print card are from that kit. I wanted to do a paper-piecing card and this kit was just perfect for it. Please make sure you leave comments for me all of this week. I'll be drawing a winner from all comments on Sunday and the winner will get two Itty Bittys of their choice from Unity. Good luck! wow so pretty! love the paper piecing. Oh my goodness, these are adorable! I LOVE those whimsical paper pieced mushrooms! I am so enjoying your 2-of-each stamp style this week. This whimsical, paper pieced mushroom is fantastic! I don't know which card is prettier. I love what you did with this fun image! The little twine bow tied to the mushroom on the second card is so cute. Great idea! Both cards are so cute! Love how you colored the mushrooms! Love the sentiment on the second card!! TFS God bless!! 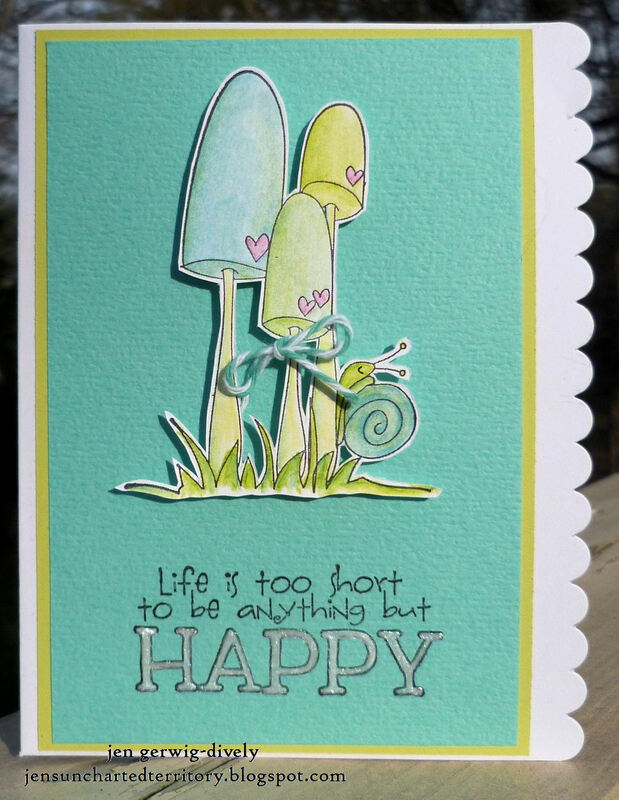 Cute cards, Jen...love how versatile your creations are with the same stamp. Way cute!! Fun cards Jen! Both versions are great! I love the paper pieced mushrooms in the top card, and your pretty coloring on the second card! What a fun image! I think I like the first one best, love me some paper piecing! Very cute cards. I haven't noticed this stamp. Great colouring. I LOVE the paper pieced one, especially because of the snail!! The mushrooms and snail are adorable! The first card is my fav! 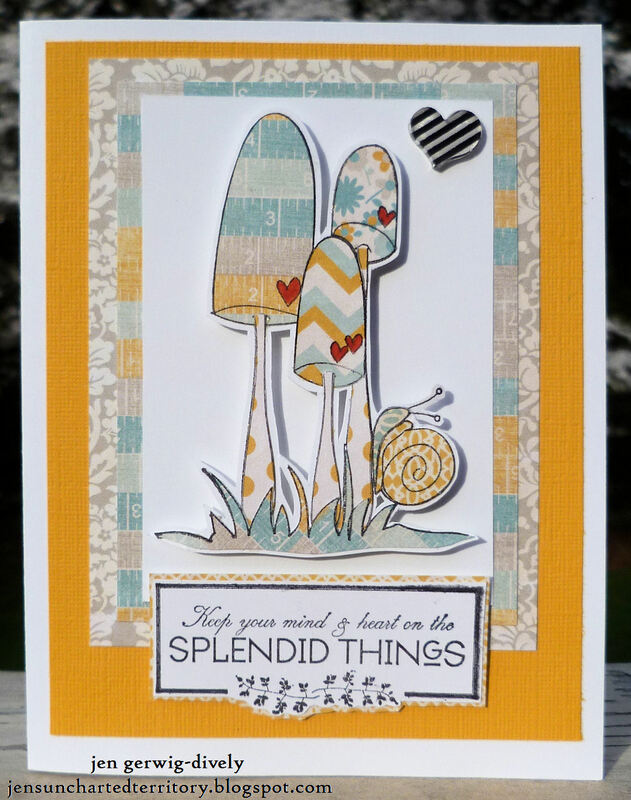 Mushrooms and snails and paper-piecing, oh my! These card are just so cute! I love the fun colored mushrooms and snail! They are both soooooo springy!!! Congrats on being on Unity! I love that company. Great cards using this stamp. What cute cards! Love the paper piecing of the mushrooms! Fun designs, Jen. Love the paper piecing! Awesome card. Love how you colored the image. Your cards are so cute with those mushrooms! Love it! Another two beautiful cards - I love both effects, the paper piercing and the coloured image. Oh my giddy aunt they are adoreable..looove the image!! GIU Wrap Up and Winner!